In Honor: Asteroid or Minor Planet 5873 Archilochos 1989 SB3, discovered 1989 September 26 by E. W. Elst at La Silla. Thales of Miletus (Θαλής ο Μιλήσιος ) observed that the so-called Big Dipper constellation never dips below the horizon in Greece, but it does when viewed from Egypt. Anaximander of Miletus (Αναξίμανδρος ο Μιλήσιος ) a student of Thales and according to Laertius the discoverer of the gnomon proposes that the Earth surface is cylindrical. Cleostratus of Tenedos (Κλεόστρατος ο Τενέδιος), Octaetris (8 years period) to match the solar and lunar period, Constellations. Pythagoras of Samos (Πυθαγόρας ο Σάμιος ) gives the name cosmos to the universe. Heraclitus of Ephesus (Ηράκλειτος ο Εφέσιος) says the Universe is 10800 years old. In 1766 Georges Buffon said that the Earth is older than 6000 years (from fossils). Anaxagoras (Αναξαγόρας ο Κλαζομενεύς) (500-428) BC taught that the moon shines with the light of the Sun (a hot red stone larger than Peloponese) and so was able to explain the eclipses. Oenopides (Οινοπίδης ο Χίος) (500-432) BC measured the inclination of the Earth axis with respect to the ecliptic plane to be 24 degrees, defined the Great Year to be about 59 years, the interval with an exact repetition of days in a year and the lunar cycle with the Sun and Moon in the exact same locations in the sky, accounting not just for months but also its inclination. Leucippus of Miletus (Λεύκιππος ο Μιλήσιος) said that the world consisted in the void and atoms, which are imperceptible individual particles that differ only in size, shape, and position. That these particles were imperceptible meant they met Parmenides' objection to the Pythagorean's geometric points and, since they alone were unchanging, change could be explained as mere sense impressions. "It is scarcely an exaggeration to say that even in 1900 the only new idea to Leucippus's theory was that each chemical element was identified with a separate atomic species" (Park 1990:41). PITHETAERUS In the name of the gods, who are you? METON Who am I? Meton, known throughout Greece and at Colonus. PITHETAERUS What are these things? METON Tools for measuring the air. In truth, the spaces in the air have precisely the form of a furnace. With this bent ruler I draw a line from top to bottom; from one of its points I describe a circle with the compass. Do you understand? PITHETAERUS Not in the least. METON With the straight ruler I set to work to inscribe a square within this circle; in its centre will be the market-place, into which all the straight streets will lead, converging to this centre like a star, which, although only orbicular, sends forth its rays in a straight line from all sides. Democritus of Abdera (Δημόκριτος ο Αβδηρίτης) developed Leucippus's atomic theory: Atoms vibrate when hitched together in solid bodies and exist in a space which is infinite in extent and in which each star is a sun and has its own world. He also produced two major concepts in the history of ideas concerning the brain--that thought was situated there and, anticipating the nervous system, that psychic atoms constituted the material basis of its communication with the rest of the body and the world outside. Socrates, and hence the Platonic school, followed Democritus in locating thought in the brain. Hicetas of Syracuse (lκέτας ο Συρακούσιος) explains apparent motion of the fixed stars by the Earth spinning on its own axis. Archytas of Tarentum (Αρχύτας ο Ταραντίνος) (428-350 BC) with a simple “Gedankenexperiment” assumes that the Universe is infinite. Plato (Πλάτων ο Αθηναίος) said, in the Timaeus, that "as being is to becoming, so is truth to belief" (Plato 1929:29c). In other words, we can only believe, not know, on the basis of experience. Like, Parmenides, he held being and truth, indeed the world, to be timeless and unchanging, an ideal of which man can only hold the idea. This permitted him a certain amount of flexibility: He was willing to accept objections to his view of the universe, for example, if the new hypothesis would provide a rational explanation or 'save the appearance' presented by the planets. The five regular polygons he ascribed to the four elements plus the "decoration" of the universe (Plato 1929:55c), probably the animals of the zodiac. Eudoxus of Cnidus (Εύδοξος ο Κνίδιος) invented a model of twenty-seven concentric spheres by which he was able to calculate the sun's annual motions through the zodiac, the moon's motion including its wobble, and the planets' retrograde motion. (27 Spheres, 1 for the fixed stars, 3 each for the Sun and Moon and 4 each for the 5 known planets of antiquity). Heraclides of Pontus (390-322) BC says that Mercury and Venus rotate around the Sun. 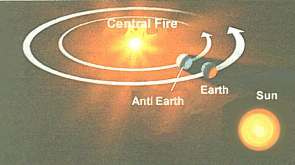 Earth rotates around its axis and is the center of the Universe. The Homocentric Spheres of Eudoxus. Έκφαντος φησί την γην κινείσθαι περί το αυτής κέντρον ως προς Ανατολήν (DK 51A1 ) (DK 51A5) ... και Έκφαντος κινούσι την γην, ου μην γε μεταβατικώς αλλά τρεπτικώς ... από δυσμών προς ανατολάς περί το ίδιον αυτής κέντρον ενηξενισμένην. Heraclides of Pontus (Ηρακλείδης ο Ποντικός ) said that the earth turns daily on its axis "while the heavenly things were at rest..., considered the cosmos to be infinite..., [and] with the Pythagoreans, considered each planet to be a world with an earth-like body and with an atmosphere" (Dreyer 1906:123-125). He also suggested that Mercury and Venus have the sun at the center of their spheres. Autolycus of Pitane (360-290) BC defined uniform motion as being when "a point is said to be moved with equal movement when it traverses equal and similar quantities in equal times" (Clagett 1959:164). Autolycus of Pitane writes On the Moving Sphere which studies the geometry of the sphere. It is written as an astronomy text. Pytheas (Πυθέας ο Μασσαλιώτης), tides are caused by moon. Archimedes and others said that he maintained that the Moon revolved around the Earth and the Earth around the Sun which remained stationary like the stars. Aratus Solensis (Αρατος ο Σολεύς)(c. 315/310 – 245/240 BC) poet (and scientist) born in Soli/Cyprus died in Pella, Φαινόμενα και Διοσημεία (The Phaenomena ) (1154 hexameters) . Probably the first scientific poem. Eratosthenes of Cyrene (Ερατοσθένης ο Κυρηναίος) calculated the diameter of the earth by measuring noontime shadows at sites 800 km. apart. Assuming the earth is a sphere, the measured angle between the sites is seven degrees and the circumference is about 50 times 800 km, or about 40000 km. Astrolabes were in use for taking the angular distance between any two objects, usually the elevation in the sky of planets. Apollonius of Perga (Απολλώνιος ο Περγαίος) writes Conics. He introduced probably first the terms 'parabola' and 'hyperbola,' curves formed when a plane intersects a conic section, and 'ellipse,' a closed curve formed when a plane intersects a cone. Hypsicles (Υψικλής ο Αλεξανδρεύς) writes On the Ascension of Stars. In this work he is the first to divide the Zodiac into 360 degrees. Hipparchus of Rhodes (Ιππαρχος ο Ρόδιος) measured the year with great accuracy and built the first comprehensive star chart with 850 stars and a luminosity, or brightness, scale. He is credited with the discovery of the precision of the equinoxes, and seems to have been very impressed that either of two geometrically constructed hypotheses could 'save the appearance' of the path that a planet follows: One shows the planets moving in eccentric circles and the other moving in epicycles carried by concentric circles (Duhem 1908:8). Birth of Geminus of Rhodes (Γέμινος ο Ρόδιος) Astronomer, Mathematician, Introduction to Astronomy (Phenomena) PDF File . Geminus writes that the Earth is a sphere, the sun and the stars are spheres of fire from the same material, there are infinite number of stars, the Moon receives its light from the Sun. Titus Lucretius Carus, writing in Latin, set forth the teachings of the Epicurean school in De rerum natura. There he held that "the soul is itself material and so closely associated with the body that whatever affects one affects the other. Consciousness ends with death. There is no immortality of the soul. The universe came into being through the working of natural laws in the combining of atoms" (Columbia Desk Encyclopedia 1975:1626). This view is supported by the force of the wind which is the result of the impact of innumerable atoms. Sosigenes of Alexandria (Σωσιγένης o Αλεξανδρεύς) (?-46) BC designed a calendar of 365.25 days which was introduced by Julius Caesar. Agrippa observed in 92 AD an eclipse of Pleiades by the Moon. Plutarch (Πλούταρχος) (46-120 AD), in On the Face That Can Be Seen in the Lunar Disk, compared the Moon to the Earth, upheld the idea of the plurality of worlds, and tried to overturn Aristotle's theory of 'natural places' (Duhem 1985:479). Although he was surprised by the Moon's apparent lack of clouds that could be a result of the lack of water he considered that the dark areas probably to be seas. This was the reason of naming such a dark areas as a mare (sea). Cleomedes (Κλεομήδης) On the Circular Motions of the Celestial Bodies. .
Claudius Ptolemaeus (Πτολεμαίος Κλαύδιος) (87-158), better known as Ptolemy, put together a thirteen volume compendium of opinion and data concerning the stars, including the Mesopotamian eclipse record. In this book, the Almagest, Ptolemy rejected the Peripatetic physics of the heavens, using circles rather than spheres. He did so in order to simplify his calculations, judging the circles to be only models devised for the purpose of calculation and recognizing that the actual movements were unknowable. The Almagest also contains errors which were not corrected until the sixteenth and seventeenth centuries: e.g., saying that the earth is the center of the universe, the planets have circular, if eccentric, orbits, and the earth does not move--because the centrifugal force would cause anything even temporarily disconnected to lag behind. On the other hand, the tables of the planet's positions were of such accuracy that Nicholas Copernicus computed most of his numbers from them. Iamblichus (Ιάμβλιχος) writes on astrology and mysticism. His Life of Pythagoras is a fascinating account.